Retention is a stormwater BMP that takes advantage of the conventional storm water basin. This collects water from the surrounding area, preventing flooding, erosion, and other types of property damage. What makes this storm water BMP unique is the ability to slowly release water from the retention area – or storm water basin – at a controlled rate. Think of this as a miniature dam system that works to prevent streams and rivers from getting overwhelmed with floodwaters and eroded. A retention basin is a storm water BMP that takes advantage of a higher orifice, which means that it will retain a permanent pool of water throughout the year. One of the benefits of retention basins over detention basins is the treatment that can be done to water. 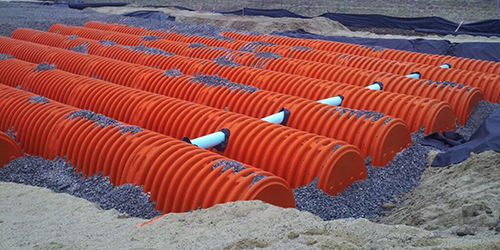 Using retention basins for stormwater BMP provides the opportunity to reduce pollutants in the water that could damage surrounding streams and areas. Light maintenance is required to ensure that this storm water BMP works properly. For instance, it’s crucial to ensure that the orifice isn’t blocked or clogged with debris, as this could hinder water flow out of the basin. However, while similar to detention, it’s important to note that retention basins are a storm water BMP that result in a permanent pool of water. Don’t worry – this isn’t like a random body of floodwater. Think of it as a man-made pond. Detention basins result in the waters eventually being empty and dried in-between each storm. An orifice is used to determine the water level, and water will drain out in a detention system so that it can refill the next time a line of thunderstorms come in.